Craving tostadas while on Keto? This recipe is for you! 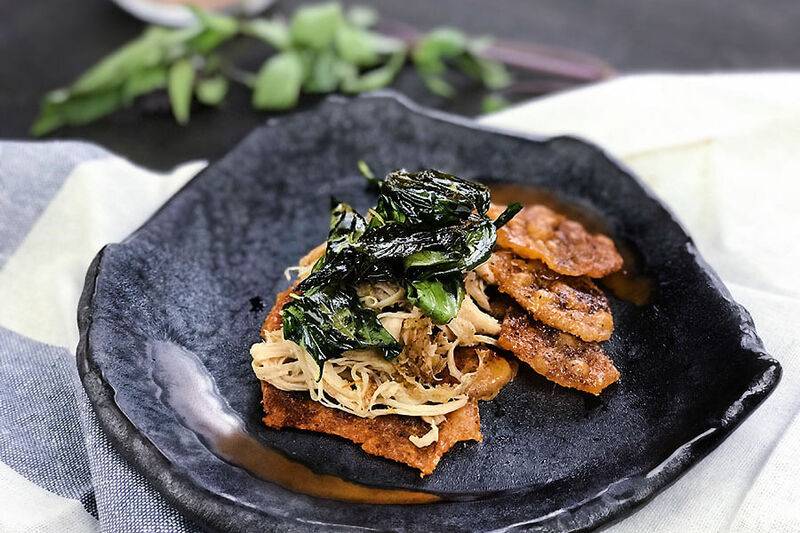 It combines the salty spicy crunch of crispy chicken skin with shredded chicken that’s been marinated in sweet, peppery spices. The chicken skin on its own is very addicting! 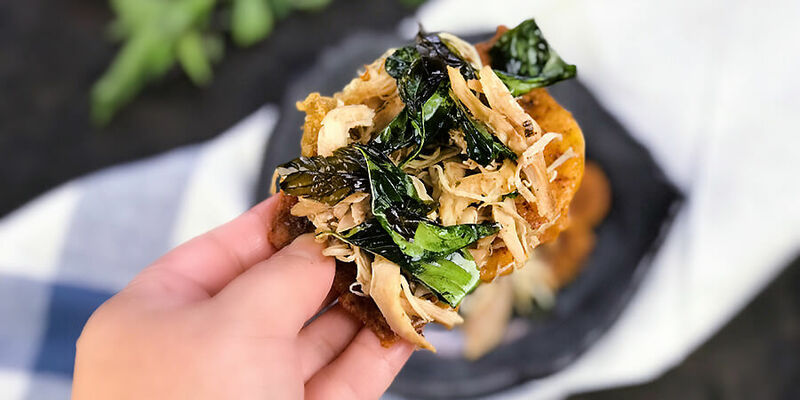 There’s quite a bit of prep time for the chicken skin and cooking the chicken, but this is recipe is great for a family keto dinner or game night. 1. Pre-heat oven to 350 degrees. 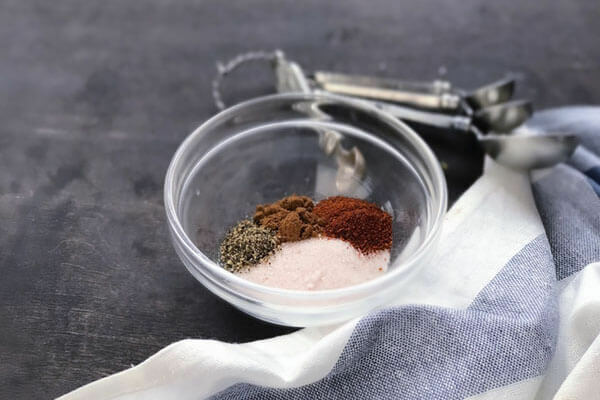 In a small bowl, combine salt and pepper, half of the five-spice powder, and chili powder. Mix well and set aside; this will be your spice salt. 2. 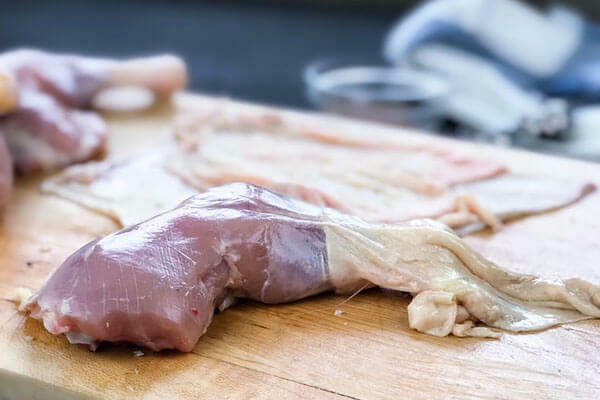 Carefully pull chicken skin off thigh over leg bone. The easiest way to do this is to maneuver your thumb in between the chicken skin and meat. 4. Season generously with the spice salt. 5. 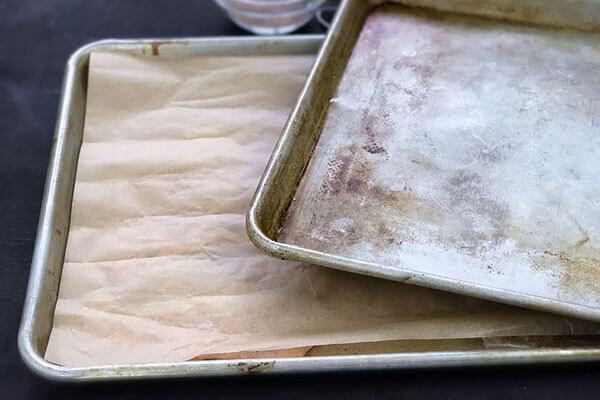 Layer a baking sheet tray with parchment paper, chicken skin, and then an additional layer of parchment paper. Place an additional baking sheet on top of the final layer of parchment paper. This ensures that the chicken skin will not stick or curl while baking. 6. Bake the chicken skin for 30-35 minutes. Remove chicken skin from the oven and set aside to cool. 7. 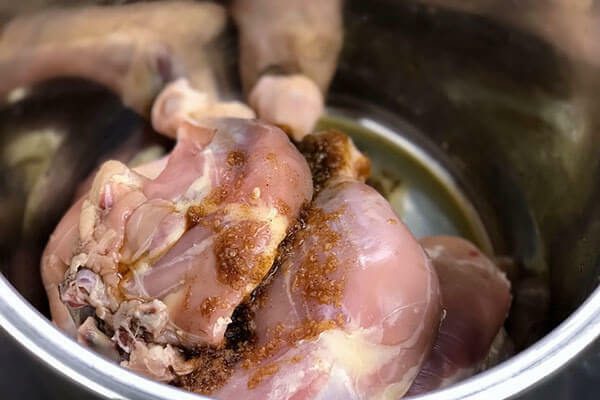 In the Instant Pot, add skinned chicken quarters with garlic, ginger, tamari, Shaoxing, sweetener, salt, and remaining five spice. 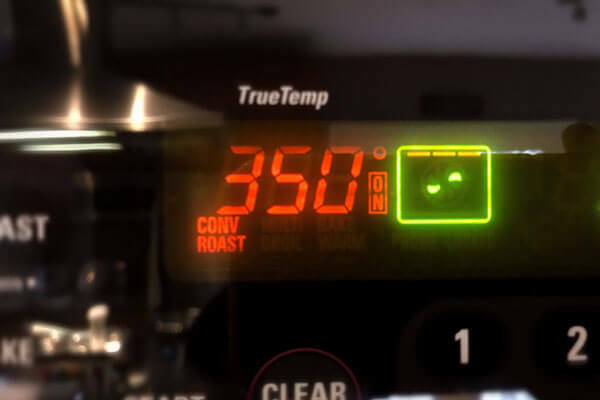 Set the Instant Pot to manual high for 30 minutes. Perform a manual release when it’s done, then turn off the Instant Pot and let the chicken cool just long enough to handle. 8. Shred chicken and set aside. 9. Pre-heat a pan on the stove. then add olive oil to it. 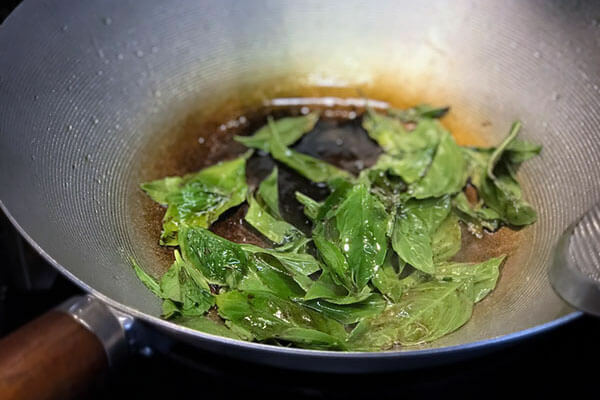 Once the olive oil is hot, scatter basil leaves and cook until translucent. 10. Remove the basil leaves and drain on paper towel. Set aside. 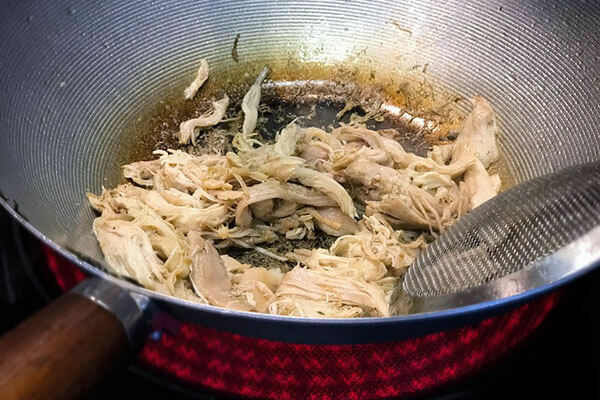 Using the same pan, add shredded chicken. Cook the chicken to give it some color and bring it back up to temp. 11. To serve, top spiced crispy chicken skin with shredded chicken, remaining spiced salt, and basil. This makes 4 servings of Spiced Crispy Chicken Skin Tostada. Each serving comes out to be 545.93 Calories, 29.9g Fats, 1.45g Net Carbs, and 62.85g Protein. Pre-heat oven to 350 degrees. In a small bowl, combine salt and pepper, half of the five-spice powder, and chili powder. Mix well and set aside; this will be your spice salt. Carefully pull chicken skin off thigh over leg bone. The easiest way to do this is to maneuver your thumb in between the chicken skin and meat. Season generously with the spice salt. 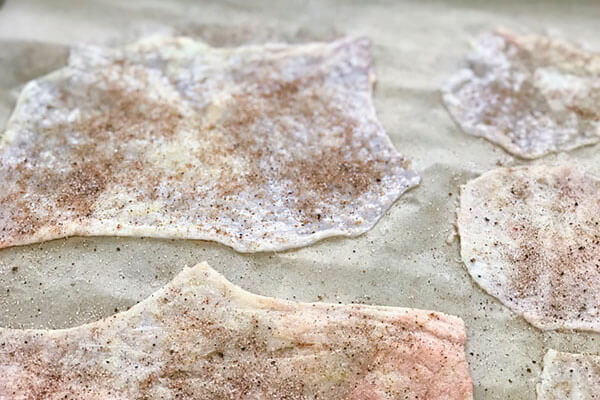 Layer a baking sheet tray with parchment paper, chicken skin, and then an additional layer of parchment paper. Place an additional baking sheet on top of the final layer of parchment paper. This ensures that the chicken skin will not stick or curl while baking. 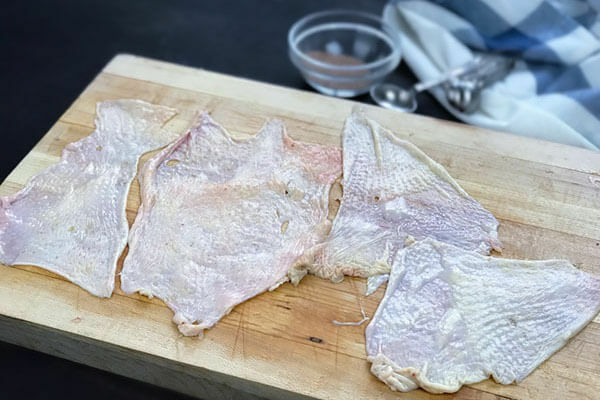 Bake the chicken skin for 30-35 minutes. Remove chicken skin from the oven and set aside to cool. 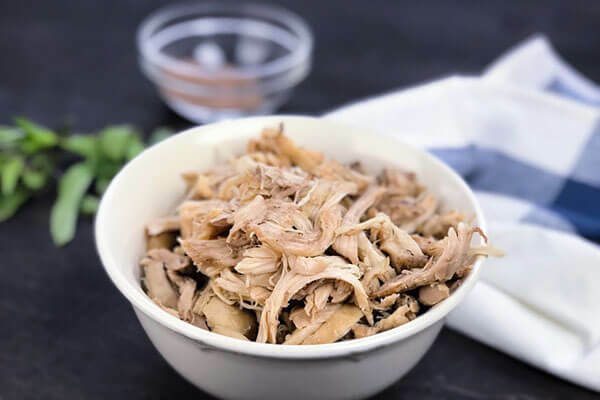 In the Instant Pot, add skinned chicken quarters with garlic, ginger, tamari, Shaoxing, sweetener, salt, and remaining five spice. Set the Instant Pot to manual high for 30 minutes. Perform a manual release when it's done, then turn off the Instant Pot and let the chicken cool just long enough to handle. Pre-heat a pan on the stove. then add olive oil to it. Once the olive oil is hot, scatter basil leaves and cook until translucent. Remove the basil leaves and drain on paper towel. Set aside. Using the same pan, add shredded chicken. Cook the chicken to give it some color and bring it back up to temp. 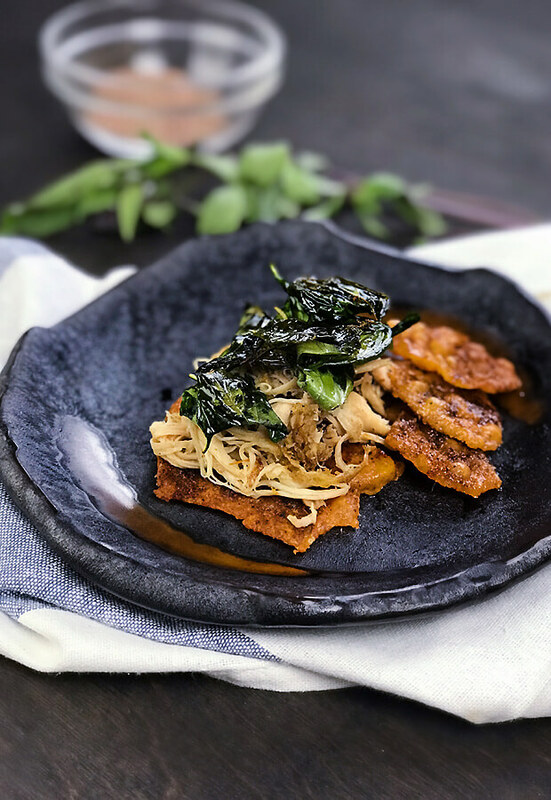 To serve, top spiced crispy chicken skin with shredded chicken, remaining spiced salt, and basil.